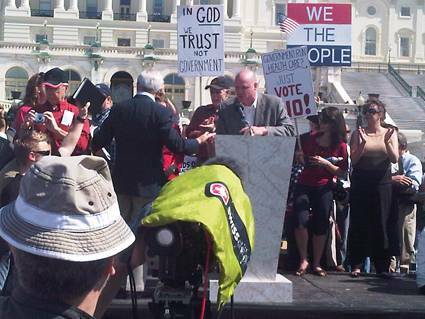 It was not long ago when that the whole country and media where covering the Tea Party movement. It started out with normal American citizens who were expressing the Constitutional right of assembly and free speech towards the agenda in Washington. They were upset at that time with the possible legislation of a National Healthcare Bill. The Tea Party passion was to validate not only to the politicians in Washington but to the rest of the world that America is still a Republic and not a Democracy. Since then a lot has transpired and unfortunately, a National Healthcare Bill was birthed without bipartisan support. The Tea Party was not against healthcare reform but against the government mandating to the people, whom they serve, what the people should or should not do in regards to their own personal health. The Tea Party consisted of Republicans, Independents, and Democrats. They were the typical everyday working man and woman who were trying to make a living in a country founded on the principles of prosperity and independence. They consisted of all ethnicities from all parts of our great country. They shared a fundamental principle in the document drafted and signed into law over 250 years ago titled the United States Constitution. Unfortunately in politics there is a box that everyone needs to learn to play in. They were either for or against an issue, and based upon their views, it would determine if they were allies or enemies. We have a long history of practicing this concept through out the history of our society. The execution of this concept is noted to divide the Tea Party movement, which was the intentions of the media as well as the political parties. If the American people unite in principle against the establishment, it will drastically change the course of the nation as well as the security of the elitist. You can see the practice of this Marxist (Conflict Theory) as it relates to the debate over illegal immigration. As long as the country stays focused and emotionally engaged in a semantic social explosive issue like illegal aliens, the federal legislature will continue to pass laws that have a more significant impact on our national sovereignty than illegal aliens who are pawns of a political process. There are those who follow the conspiracy theory of a New World Order (One Government) and those who consider it an urban legend like the existence of aliens. I personally consider myself a sensible man who has learned to accept that I do not know everything, but I am open to all possibilities and will use my Christian values to decode any symbolism or information I receive. The Tea Party was a spiritual movement that united people across all economic and racial lines to object to any tyranny by any government especially the one that is supposed to serve them. They believed in practical solutions utilizing a moral compass of what is right and wrong and that this moral compass belonged to no specific organization or political party. The Tea Party developed into a significant powerful political force that generated fear in the status quo of our government. Once they achieved this status, it was important for the “machine” as Senator Scott Brown likes to use, to do damage control and the first and most common tactic is to vilify them as Christian extremist with volatile tendencies. Once the connection was made with Judeo-Christian society it was then practical first, for those Independents and Democrats to drift away based upon social reframing of separation of Church and State. It was then tactical for the “machine” to lure constituents away with semantic social issues that have continued to divide our country today while sustaining the elitist (Democrat and Republican) to control governmental policy and information. The old saying, “United We Stand, Divided We Fall” is as true today as it was when it was first stated. The Tea Party is divided between the social semantic issues much like the Republican Party is divided between Conservative and capitalist issues. The Democrats are divided between the morally Conservative and the Liberal progressive. The Tea Party represented the true euphemism of the American Patriot. It consisted of everyday hard working, law abiding, sacrificing moral citizens who were frustrated with the bureaucracy and the unbalanced power of the federal government functioning under the auspicious of national emergency or financial crisis. So what is the answer? Well, the answer is as simple like the motto of the Texas GOP Vote; Restore, Renew, Reunite! Restore the faith back to the people who are the primary and only executives of the government. Renew our vows to support and defend the Constitution of the United States. Reunite the people under the principle of “We the People” by using the resources, technological or primitive, and registering voters and holding each other accountable in voting. It is not the government’s job or the Party’s job to ensure we vote it is our job and many of us have stopped doing our job and but continue to blame others. We the People are not a party, but Americans! We the People are not an interest group with an agenda other than to support and defend our Constitution. It is of utmost importance to not let anyone or anything divide our faith in the good of our fellow man regardless of his race or ethnicity. It is important to stay united via personnel communication versus the sensational media (radio, television, and internet). Look for your fellow man and help him out much like Christ did over 2,000 years ago. Do not be dependent on the government of financial institutions, who merely look to capitalize on our despair and division. United as people of faith in one another is the resolution that no government or agency can demoralize or destruct. I personally am a man of Christian faith, which is to say that I believe in Jesus Christ. Notice that I did not say I was Catholic, Baptist, Methodist, Evangelicals, or any other Christian denomination but that I was Christian. As a Christian, I have the deepest faith in you, and that together we can restore, renew, and reunite our faith in America! Faith is an easy concept to understand. It is to believe much like we believe in our favorite NBA team or hockey team winning the championship. To believe in yourself and your virtues are what distinguish the difference between being free and being victims. I believe in you, and therefore I believe in America. I believe that We the People can restore, renew, and reunite our moral principles and responsibilities in God, Country, and Family!